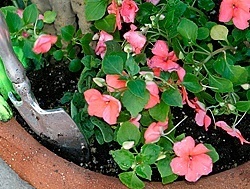 Growing impatiens from seed is a good way to save money if you like to plant flats and flats of these popular annuals. The ideal time to start is eight to 10 weeks before the last frost in your area. Fill seed flats with a sterile seed-starting mix that you have moistened. It should be damp but not wet. Impatiens seeds are very tiny, so scatter them over the surface and press down lightly. If you’ve used flats from a seed-starting kit, just cover them with the plastic cover that came with this. If you’re sowing into containers that you are reusing, be sure they are sterile (wash them in water with detergent and a little bleach), and cover them with plastic wrap after sowing, or put the entire flat into a clear plastic bag. Learn more with these seed-starting tips. Place your flats under grow lights or near a window where they get bright indirect light. The soil temperature should be about 70 to 75º F (21 to 24º C). Your impatiens seeds should sprout within seven days to two weeks, although it can sometime take a little longer if temperatures are cooler. Remove the plastic cover or plastic wrap as soon as the seedlings germinate. Impatiens seedlings are very susceptible to a fungal disease called damping off, so be very careful not to over-water them. Bottom watering is best. Once your seedlings have several new leaves, transplant them into flats in cell pack containers filled with growing mixture. Transplant one plant per cell. Water and fertilize regularly with a balanced water-soluble house plant fertilizer. Wait until the danger of frost is past before planting your impatiens in the garden. When temperatures are safely above 50º F (10º C), impatiens will thrive, and your plants should continue to bloom profusely until frost.